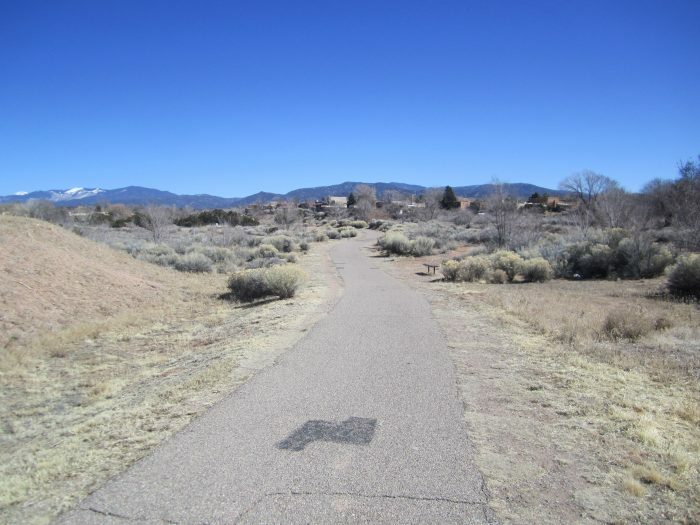 Santa Fe’s Arroyo de los Chamisos Trail was one of the first I encountered when I moved to ‘The City Different’. I was looking for a nice easy jog and Googled “best places to run in Santa Fe”, finding Great Runs for the first time. After reviewing the local options, I went for a run on the Arroyo de los Chamisos Trail on an early August morning. I parked at the Monica Lucero Park and ran past shopping centers, adorable neighborhoods, and the high school. This particular run was far more interesting than I expected and really made me feel great about my decision to move to Santa Fe. What I saw next was what really made the run a special one. About 2 miles in, when I was farthest away from town, I spotted 2 coyotes trotting along the trail. One was quite large and with no other people in sight, it made me a bit nervous as I’m not used to seeing coyotes as large as this one and in the wide open like this. I was worried that a larger pack may be nearby. They were headed in the same direction I was and noticed me shortly after I saw them. I could tell my presence made them feel uncomfortable and they quickly diverted off the path and headed toward the brush. I kept jogging, perhaps a bit more quickly than before, and soon they were out of view. Needless to say, that got my heart racing and filled me with a burst of adrenaline to finish my run. When I got back to my car, I was surprised to see that what I planned to be a 45 minute leisurely jog had turned into a far speedier 35 minute run. To this day, this is still one of my most memorable running experience and certainly a warm welcome to my new home in New Mexico.